I've been too busy to post frequently lately so here's a bumper roundup of everything that's been happening, including the news from today's stage presentation at Tokyo Game Show 2015. 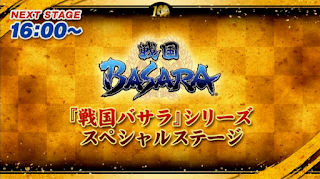 It was a long post even before the stream began; there's been a lot going on, from tickets going on sale for Butai Sengoku Basara 4 Sumeragi to various new difficult-to-obtain merchandise being announced! The presentation began with producer KobaP coming on stage and modelling the pricey Sanada Yukimura jacket from Premium Bandai (more on that below). They showed a bunch of promotional videos to introduce Sengoku Basara 4 Sumeragi and the tenth anniversary of Sengoku Basara then launched invited members of the audience onstage to try the live Tenka Medal Challenge in Sengoku Basara 4 Sumeragi. Depending on the total number of medals the fans collected, they could win various prizes. 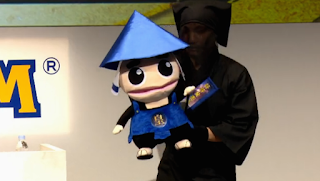 Less than a thousand medals awarded a scrubbing brush, 2,000 meant bags of Sengoku Basara prizes for the three players at the event, 5,000 medals earned a special anniversary wallpaper for everyone (it will be posted on the official website) while 10,000 medals was enough to win a prototype Ashigaru-kun mascot reward. 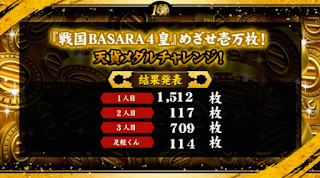 The first player collected over a thousand medals with a Sasuke/Yukimura team, while the second had never played Sengoku Basara before and only managed a hundred with the same characters. 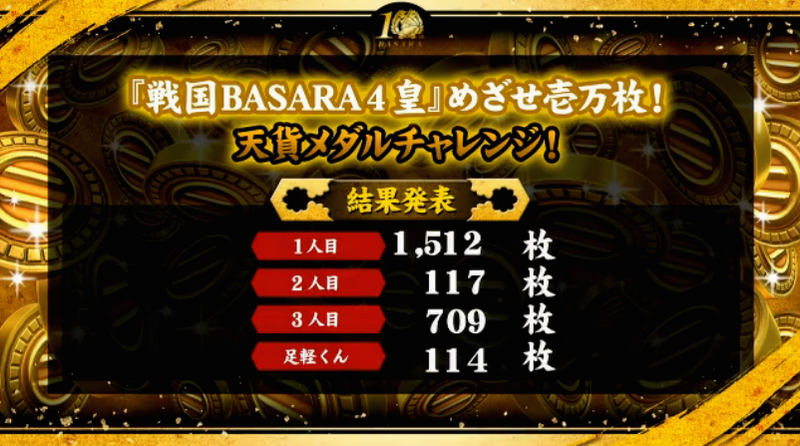 The third player picked Mitsunari and Gyoubu and didn't quite manage to accumulate a thousand. After the guests were done, Ashigaru-kun himself started playing (with Ieyasu/Tadakatsu) on the Kawanakajima Intrusion stage to show the audience how it was done and did even worse than the new player. There was a lot of apologising. 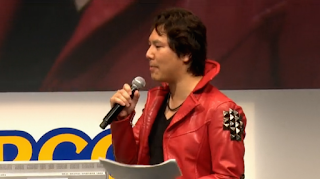 Once the gameplay was over, KobaP launched into his announcements by describing the recent Sengoku Basara 4 Sumeragi patch to the audience. The rest of the announcements will be in their own sections below (I skipped the ones which have already been mentioned before). 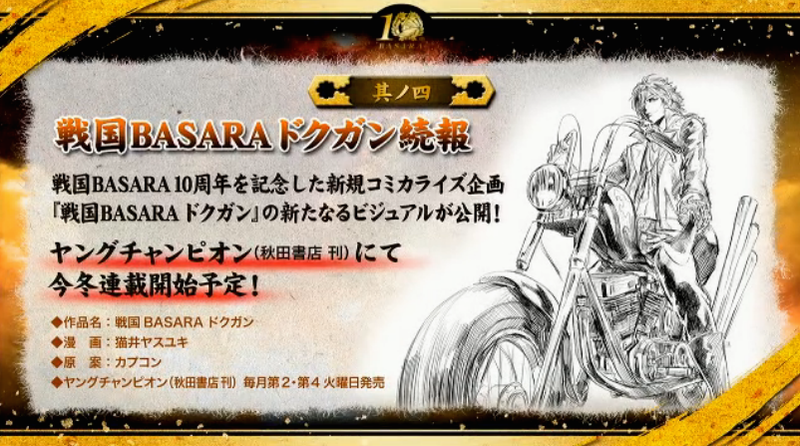 It's not a regular Basara Matsuri this time, but instead Sengoku Basara 10th Anniversary Matsuri ~Feast of Ten Years, Ten Shades~. The event will be held in Hall A of the Tokyo International Forum on Saturday 5th and Sunday 6th March 2016. The guests for the Saturday will be seiyuu Hoshi Souichirou (Sanada Yukimura), Morita Masakazu (Maeda Keiji), Ookawa Tooru (Tokugawa Ieyasu), Genda Tesshou (Takeda Shingen), Ishino Ryuuzou (Chousokabe Motochika), Nakahara Shigeru (Mouri Motonari) and Hayami Shou (Akechi Mitsuhide/Tenkai). Sunday's guest list is very similar with seiyuu Nakai Kazuya (Date Masamune), Hoshi Souichirou (Sanada Yukimura), Morita Masakazu (Maeda Keiji), Ookawa Tooru (Tokugawa Ieyasu), Ishino Ryuuzou (Chousokabe Motochika), Nakahara Shigeru (Mouri Motonari) and Hayami Shou (Akechi Mitsuhide/Tenkai). Additional guests and musical performers for both dates will be confirmed later, and of course KobaP will be there as usual. Tickets will go on sale from 15th October 2015 for fan club members or 6th December 2015 for general customers. 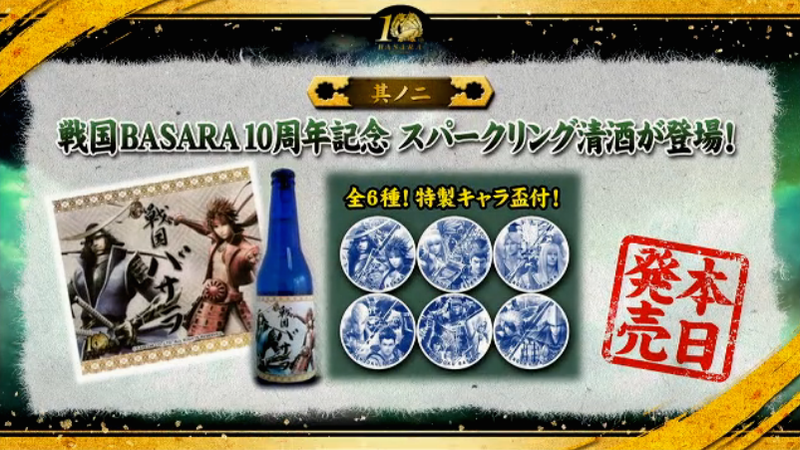 The next new product in the Sengoku Basara merchandise range is Sengoku Basara 10th Anniversary Sparkling Sake. 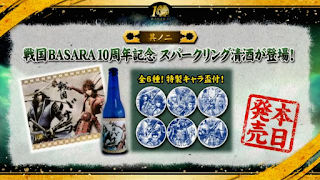 The bottles will come with decorated labels and there will be a total of six designs: Masamune/Yukimura, Maria/Yoshiteru, Wabisuke/Sabisuke, Mitsunari/Ieyasu, Hideyoshi/Hanbee/Keiji and Motochika/Motonari. More details have been posted here. The sake will cost ¥3,519 and it's available from select venues starting today. The Kofu x Sengoku Basara project is continuing to attract visitors to the Yamanashi region and the latest announcement is that they will be hosting a Sengoku Treasure Hunting Game starting from 5th December 2015. More details will posted on their tie-in website here. Nekoi Yasuyuki's new modern day Sengoku Basara Dokugan manga is scheduled to begin this winter and a new illustration has been released to draw attention to it. The manga will be serialised in Akita Shoten's Young Champion magazine which is released on the 2nd and 4th Tuesday of each month. You can see the artwork up close here. A new series of three drama CDs are coming soon from Frontier Works. Their plots all sound quite similar and it's an interesting formula to set up some character interactions. 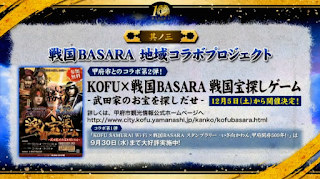 The first volume will be about Masamune and Yukimura and the cast will be Nakai Kazuya (Date Masamune), Hoshi Souichirou (Sanada Yukimura), Morikawa Toshiyuki (Katakura Kojuurou) and Koyasu Takehito (Sarutobi Sasuke). The plot is about Yukimura and Sasuke coming across the Date army while roaming in the mountains, and turning what began as a cooking battle into an all-out azure-crimson battle. The second is about Ieyasu and Mitsunari starring Ookawa Tooru (Tokugawa Ieyasu), Seki Tomokazu (Ishida Mitsunari), Nakamura Yuuichi (Shima Sakon) and Okamoto Nobuhiko (Shibata Katsuie). The four men take shelter from a storm in an empty house, which forces them together unexpectedly under a cloak of darkness. The third CD is just about Sen No Rikyuu and the cast list is Sakurai Takahiro (Sen No Rikyuu), Ishino Ryuuzou (Chousokabe Motochika), Nakahara Shigeru (Mouri Motonari) and Morita Masakazu (Maeda Keiji). That's an interesting selection of characters. Motonari and Motochika chance upon one another in a Kyoto teahouse. The tense situation develops further when Keiji is called upon to mediate. 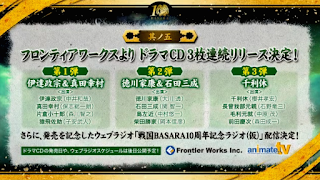 In addition, there's going to be a new Animate TV radio show tentatively titled Sengoku Basara 10th Anniversary Radio to celebrate the release of the CDs. Further details will be available at a later date. 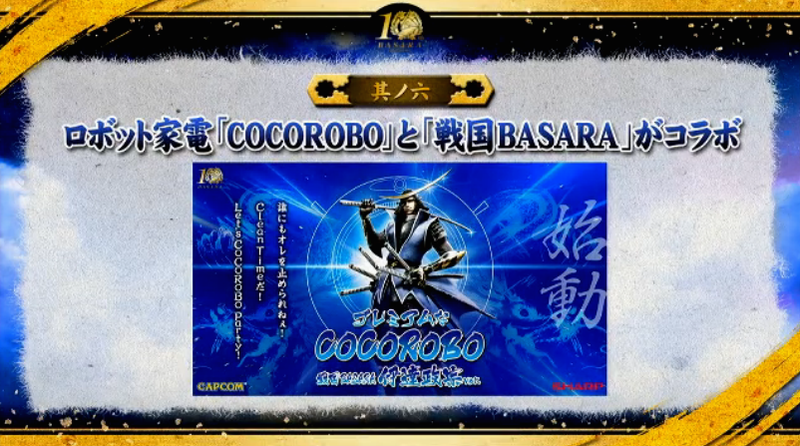 Details are sketchy but it seems that Date Masamune is going to be the inspiration for a premium voiced roomba vacuum cleaner in Sharp's Cocorobo line in the near future. It's CLEAN TIME! Let's COCOROBO Party! 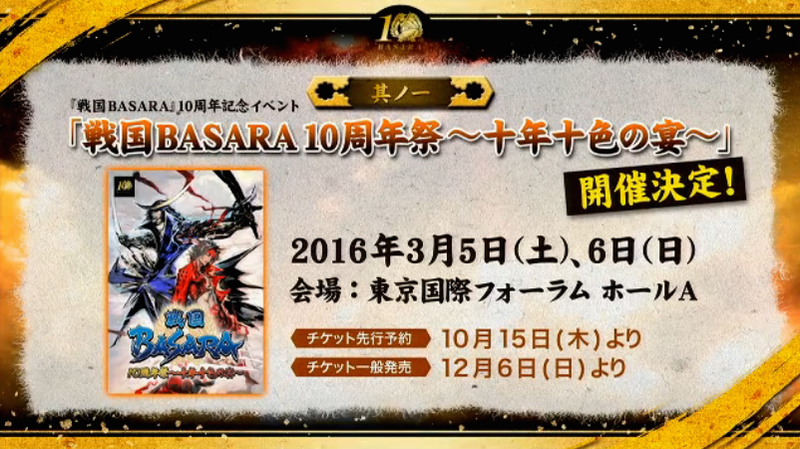 I'm not sure whether I blogged about this before since I originally mixed it up with the delayed Sengoku Basara Seishi ("The Official History of Sengoku Basara") book, but there's a new publication in the Pia Mook series called Sengoku Basara Pia ~10th Anniversary~ which is coming out on 30th September 2015 priced at ¥1,400. 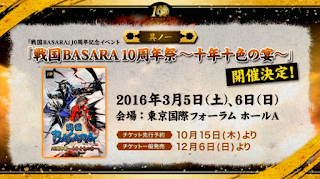 Naturally, the theme is the series' tenth anniversary and the cover illustration is a tribute to the very first game's box art. Introductions for the various playable characters who appear over the course of the series. Explanations of the stories covered in each game. Special interviews and messages. There will be a pair of joint interviews with Nakai Kazuya (Date Masamune)/Hoshi Souichirou (Sanada Yukimura) and Koyasu Takehito (Sarutobi Sasuke)/Kobayashi 'KobaP' Hiroyuki (series producer). These will be accompanied by messages from T.M.Revolution and the very popular former Butai Sengoku Basara actors Kubota Yuuki (Date Masamune) and Hosogai Kei (Sanada Yukimura). A look back at the series' various adaptations and tie-ins, including the anime spin-offs, stage plays and live events. There will be messages from some of the anime staff too. A guide to the actual historical ties the popular warriors had with various locations. There will also be a desktop calendar included with the mook as a bonus item and covers the 14 months between November 2015 and December 2016. For those unfamiliar with the terminology, a mook is a blend of a magazine and a book. If you think of the way that most gaming strategy guides are published, you can expect something similar - a sturdy magazine intended to be kept and treasured for a while. 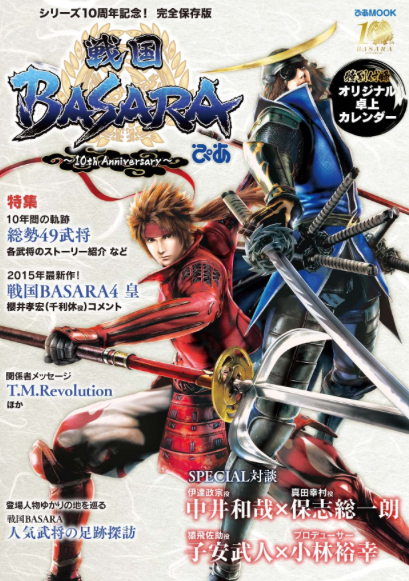 The two Basara Club Fan Meeting 2015 Autumn events will be happening in a few weeks' time, and the fan club has just announced that a small number of ¥5,500 tickets would be available at the venue on the day. If you happen to be (or know) a member of the fan club who is close enough to Tokyo or Osaka to be able to check the venue, you might get lucky and be able to attend one of the shows. 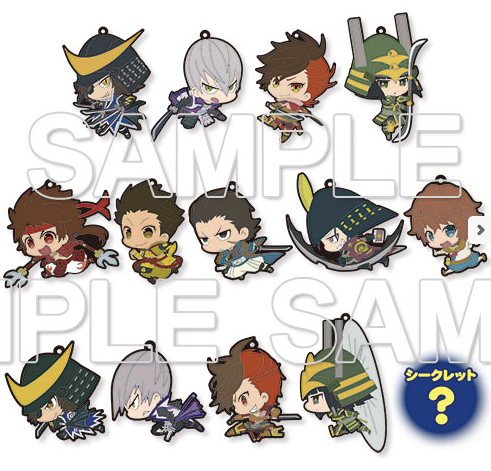 The official Sengoku Basara qualification exam is drawing closer and its website has updated to reveal the existence of some special merchandise for participants to buy - except that the pictures won't be ready until closer to the late November date of the exam. 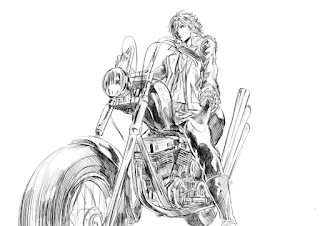 The illustrations being used have been created exclusively for the event and there will be an acrylic key holder (¥1,000), a set of two original clear files (¥1,000), a set of five original postcards (¥1,000) and a pouch/hand mirror set (¥2,500). A special offer will be running until 23rd September 2015 whereby customers who purchase the digital version of Sengoku Basara 4 Sumeragi from PSN will receive an exclusive limited edition bundle along with it. For the standard price of ¥5,990 (PS3) or ¥6,990 (PS4), customers will receive the Sumeragi Starter Pack (large) and the full moveset unlock DLC. The Sumeragi Starter Pack (large) contains 100 pieces of tamahagane steel, 10,000 whetstones, 75,000 Tenka Medals, 750,000 ryou in cash and 450,000 xp for your Inrou box. That's a saving of ¥800 if you were planning on purchasing those items anyway. Those who have been eagerly looking forward to the new Sengoku Basara 4 plushies from Gift x Algernon can take a closer look at Shibata Katsuie and Date Masamune (Hakama & Wooden Sword Ver.) as the official product pages are now ready for viewing. They look just as high quality as the rest of the Gift product line. The first batch of these new plushies will be available on 25th October 2015 as part of the Gift Shop 2015 Autumn Plushie Day fair in Tokyo. They'll be made available via other shops after that, so keep checking AmiAmi and other reliable toy specialists if you want to order either of these plushies before they sell out. 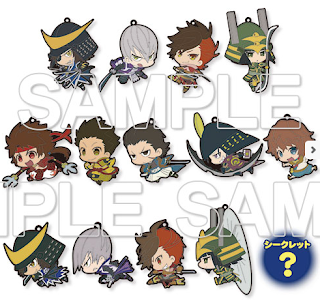 The Mame Sengoku Basara 4 Trading Rubber Strap Collection mentioned previously is now available for preorder ahead of its release on 27th November 2015, and Dengekiya has posted a sample showing how the individual straps in this ¥9,072 pack are expected to look. AmiAmi have opened preorders for overseas customers. The matching Mame Sengoku Basara 4 Trading Can Badges are also online at Dengekiya with the same release date and a price tag of ¥4,536. 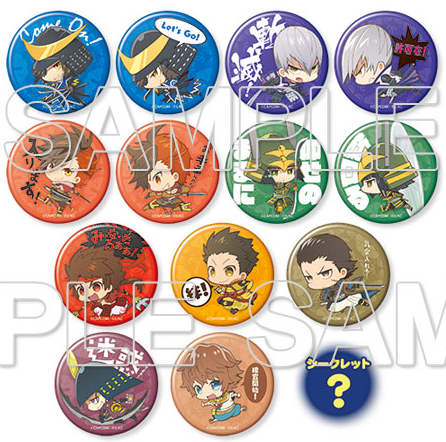 AmiAmi have listed the badges too. 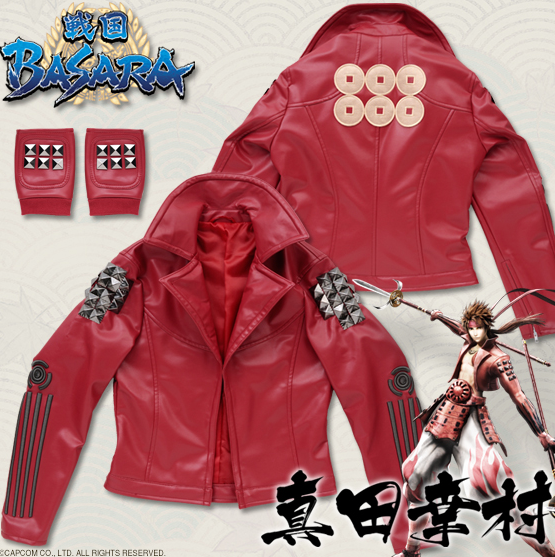 Remember the extremely expensive Premium Bandai Sanada Yukimura Jacket? It seems to have been successful enough that it's being made available for order a second time. The preorder period will close on 19th October 2015 with delivery expected for December. If you have a spare ¥100,000 lying around, this is another chance to purchase a very exclusive piece of merchandise. As different arcades will change their prize offerings from time to time, fans will have to keep checking their local facilities to find out when they will be available. 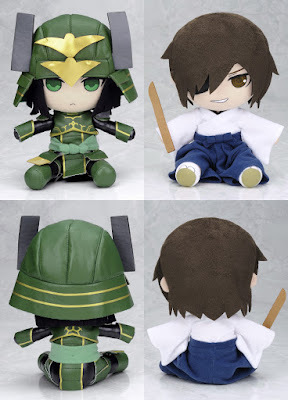 I'm encouraged by the fact that Banpresto have created a website specifically for Sengoku Basara prizes. Perhaps there will be more in future, even if it's always hideously difficult to collect them from outside Japan. Fans tacotits and kleptoyade have posted a great picture report from the Osaka: Mysterious Rebellion ~Escape From Namba's Hidden Castle Town~ (Side Story) event starring Sengoku Basara's Sasuke, which has been running intermittently in the Namba Walk complex this year. The post gives a good idea of how fun these historically-themed events are to attend! Finally, I want to share some pictures of two of the clear files that were given to Keikyu railway passengers who participated in the Showdown! The Way of Battle Leading to Haneda! Stamp Rally campaign. I wasn't able to take part myself, but my wonderful father and little brother happened to be visiting Japan at the right time so they hopped on a train to Kamata on my behalf. 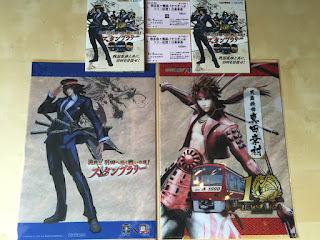 The staff at the station were thrilled to meet two very confused foreigners who kept mumbling about Sengoku Basara tickets and really helped them out. They had only been intending to pick up the clear files and leave since an untranslated stamp rally isn't that fun for people who aren't interested in the series, but one thing led to another and they ended up taking a ride on the Keikyu trains as well. Thanks, Dad! If I didn't have work, I was gung ho about staying up to watch this stream, but doesn't seem much was missed. Was really hoping for some tangible game announcement. And there's still nothing about that supposed Sanada game, right? There... isn't much artwork at all, to be honest, but some of the historical information is interesting. If I ever get myself organised I'd like to translate some of the articles. Yeah, in retrospect I KINDA wish I just got the Sumeragi artbook instead as most of the stuff seems less like "oh this character is like this because historically this happened" and more just general bios, and I already know a lot about most of these figures. I might be wrong though, as I only just translated bits and pieces. @w@; Though the stage artwork is nice! The thing I am most happy about so far is that they explained what Muneshige's Giga Basara meant (the three fish). It has bothered me that I didn't know ever since I first saw it. Oh! Wow, okay, it looks like I was wrong about that. I'll have to try "reading" the others then. And it's great to know what the fish are all about, that makes sense.